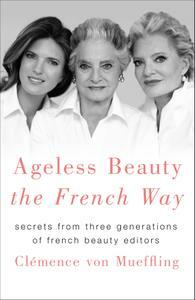 From three generations of French beauty experts, Ageless Beauty the French Way is the ultimate book of tips, products, practices and French beauty secrets in ten categories such as Hair, Skin, Makeup, Sleep, and Perfume. While many women are passionate about the best skin care lines, hair treatments, and beauty practices, Clémence von Mueffling has that passion in her DNA. Both her mother and grandmother were beauty editors for French Vogue, and Clémence proudly continues their legacy in Ageless Beauty the French Way, a luxurious, entertaining, unparalleled guide to every French beauty secret for women from all walks of life. Learn the most effective ways to let your natural beauty shine through; that double-cleansing your face is the only way to go; that there is more to choosing the perfect perfume than you ever imagined; and that a simple, nightly facial massage is the ultimate secret to an ageless, glamorous, youthful face. Weaving wisdom from all three women with insiders tips from top beauty experts, Clémence shares both timeless and age-specific information in three categories—Jeunesse (15-35), Plénitude (35-55), and Maturité (55+)—creating a wonderful guide that any woman can cherish throughout her life, and pass down to her daughter through the years.